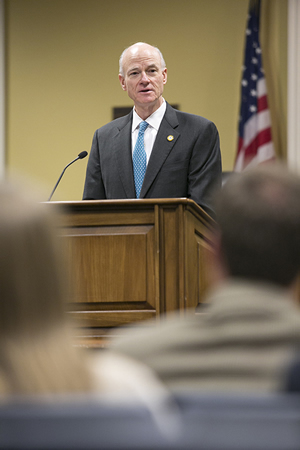 Access to justice for all is a major challenge facing the United States, American Bar Association president William C. Hubbard told students at Samford University’s Cumberland School of Law on Oct. 16. “Access to justice is a pillar of our society, but that pillar is weakening and potentially could crumble,” Hubbard said. And the future lawyers, with their fresh, innovative thinking and technical know-how, may hold the answer to close the justice gap, said Hubbard, a guest of Cumberland’s Cordell Hull Speakers Forum. The Columbia, South Carolina, attorney cited statistics that 80 percent of people who are poor, and many others of moderate means, do not get the civil legal assistance they need. In some states, in 95 percent of cases in the family courts, at least one party is not represented by counsel. Almost 3.7 million people use the nation’s nearly 500 court-based legal self-help centers but many centers have to turn people away, and half of those who apply for legal aid are turned away because of a lack of available resources to help, he said. The U.S. ranks 66th of 99 countries in accessibility and affordability of civil justice in a World Justice Project’s 2014 Rule of Law study, said Hubbard, who serves as chair of the board of directors of the WJP. “You cannot have a society governed by the rule of law when people who are at risk of having their rights denied do not have access to a lawyer to advocate on their behalf. You cannot establish justice, as our constitution mandates, when people do not have access to justice,” said Hubbard. According to American Bar Foundation research, less than one-quarter of civil justice problems in the U.S. are taken to a lawyer. “Many on the lower end of the socio-economic scale do not seek legal help because they do not recognize their problems as legal problems. They see them as personal problems, moral failings or issues that just happen in life. There is a big educational component that we must recognize,” Hubbard said. And while the poor may do nothing, those in the middle-income bracket may engage in some form of self-help using online services, or they try to go it alone. The one-on-one model of one lawyer working in person with one client at a time does not meet the demand, he said. The answer is to engage in fresh, innovative thinking about how to close the justice gap while enhancing opportunities for lawyers in their practices, said Hubbard, who helped establish the ABA’s Commission on the Future of Legal Services. The profession needs innovative approaches to leverage technology—smart phones, tablets, new software, the internet—in order to identify new models to deliver legal services, said Hubbard, commending his Cumberland hosts on the school’s new eDiscovery Institute and Review Center. Smartphone apps could make legal assistance more available and user-friendly to a wider audience. A “disastr” app, for instance, provides public safety information, news and legal presentation forms that can be helpful to disaster victims. “Smartphones have revolutionized the way we access information. Now they offer the possibility of revolutionizing the way we access courts,” he said. He noted the rapid rise in dollar investments in legal technology start-ups, a figure that is expected to top $1 billion in 2014. “These are not investments in law firms, but are technology companies that offer legal services. Our challenge is to marry this creativity with our justice system to provide greater access while protecting the public,” he said. He told the students that they, having grown up with innovation and technical know-how, are the innovators and entrepreneurs with the capability to rethink problems and re-imagine solutions.